In terms of product type, the global surgical drainage devices market has been segmented into active drainage and passive drainage. The active drainage segment is projected to grow at a rapid pace, as active drainage provides higher efficiency in wound healing than passive drainage. Based on application, the global market has been classified into general surgery, orthopedics, thoracic and cardiovascular, obstetrics/gynecology, plastic/reconstructive surgery, and neurosurgery. The orthopedics segment accounted for the largest market share in 2017, owing to rise in prevalence of musculoskeletal diseases such as rheumatoid arthritis, lupus erythematous, and osteoporosis, and increase in number of orthopedic procedures such as hip replacement, and knee replacement. In terms of end-user, the global surgical drainage devices market has been categorized into hospitals, independent clinics, ambulatory surgery centers, and others. The hospitals segment held the largest market share in 2017. The segment is anticipated to expand at the highest CAGR during the forecast period. Hospitals are the preferred choice among people and are highly favorable settings for procedures due to safe health care treatment procedures, health care insurance coverage, presence of developed health care technology, and availability of beds for a large number of people. 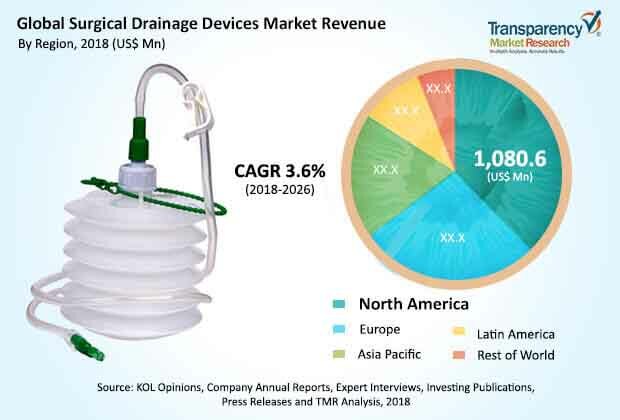 Key companies operating in the global surgical drainage devices market and profiled in the report include B. Braun Melsungen AG, BD, Cook Medical, Medtronic, Teleflex Incorporated, Stryker, Johnson and Johnson, Cardinal Health, REDAX, Smith & Nephew plc, Acelity L.P. Inc., Integra LifeSciences, and Medela AG. Major industry events related to the global surgical drainage devices market are the acquisition of C. R. Bard by Becton Dickenson in November 2017, acquisition of OrthoD Group (a U.K-based company on wound drainage and other fixation devices) by Apposite Capital in March 2018, acquisition of Argon Medical Devices (a U.S.-based company on drainage catheter) by Shandong Weigao Group Medical Polymer Co. in September 2017. Surgical drainage devices are equipment that drain excess fluid or air from the operation site or wound so that the risk of formation of hematoma is reduced and wound healing process is accelerated. Lack of clinical knowledge and expertise and product recall are likely to restrain the global surgical drainage devices market during the forecast period. The global surgical drainage devices market report comprises an elaborate executive summary, which includes a snapshot that provides information about various segments of the market. It also provides information and data analysis of the global market with respect to the segments based on product type, application, end-user, and region. A detailed qualitative analysis of drivers and restraints of the market and opportunities has been provided in the overview section. Additionally, the section comprises competitive matrix and company profiles with business overview to understand the competitive landscape in the market. This section of the report also provides market attractiveness analysis by region and market share analysis by key players, thereby presenting a thorough analysis of the overall competitive scenario in the global surgical drainage devices market.